Howdy howdy hey hey ho ho hewww! Let’s make some cleaner with oils, me and youuuu. So, a few of you asked me to write a post about how I use essential oils in my daily riff raff. I think I literally said, “daily riff raff.” And for that I’d like to seek forgiveness. First of all, a little bit of background! It was about five or six birthdays ago when Aaron gifted me a book on natural beauty, a few basic oils from my favorite local hippie store, and some coarse salt to make a scrub. He’s the raddest dude, am I right? It was then that I discovered this whole ESSENTIAL OIL craze. Except back then it wasn’t a craze. It was just ohhh whatever I use essential oils. I obviously researched the safest way to use them (because people be like super crazy scared of them right now), and I found three of my favorite ways to utilize oils, plus a few little tips I’ll share. Also, this is so not sponsored. I use NOW, but you can use any old kind your heart so desires! I hear Young Living is awesome, too. I’m gonna give you two recipes: one that’s an all-purpose cleaner, and the other will be a glass cleaner. Sometimes I’ll grab the glass cleaner and accidentally use it on the counter, but I’m pretty sure that won’t turn me into a centaur. Also, last summer I bought some sturdy 16 oz glass spray bottles on Amazon, and I seriously love them. I keep them labelless because I’m a freak about simplicity. I can always tell the cleaners apart because the oils I put in the all-purpose are darker. Actually, hold on, so far I’ve only put tea tree oil in the glass cleaner, so that’s why. It’s clear. Ha! Anyway. All-Purpose: 1 cup HOT water + 1 cup distilled white vinegar + 1 tsp Borax powder + 1 tsp Arm & Hammer washing soda + 10 drops Bergamot essential oil, 10 drops Patchouli essential oil and 10 drops Eucalyptus essential oil. Combine everything in a large glass measuring cup. The Borax and washing soda will fizz up a bit. Stir it all around with a spoon until it settles. Gently pour into a glass spray bottle, ya DANG HIPPIE. Glass: 1 1/2 cups water + 1/2 cup distilled white vinegar + 20-25 drops of tee tree oil (Trader Joe’s has some!). Combine everything in a large glass measuring cup. Stir to mix and gently pour into your glass bottle, ya TREE HUGGER. Now, you can totally experiment with different oils to get that exact scent you want. You may want something with more citrus in it, like orange or lemon. But because I’m a complete weirdo, I prefer a slightly huskier scent for my cleaners. Don’t tell the authorities. Room spray was one of the veeeery first ways I used oils. We’ve played around with different scents through the years, but this one we keep coming back to. Oh, the amber glass bottle is also 16 oz, and you can get it on Amazon. Dang I should have some affiliate links! I’m the worst blogger. Room Spray: 2 cups water + 15 drops Lavender oil, 15 drops Rosemary oil and 15 drops Peppermint oil. Gah, it’s so nice. You can even spray it on curtains and linens before guests arrive, ya FLOWER CHILD. Aaaaaaand of course, scented soy candles. I have a supreme problem with making candles. 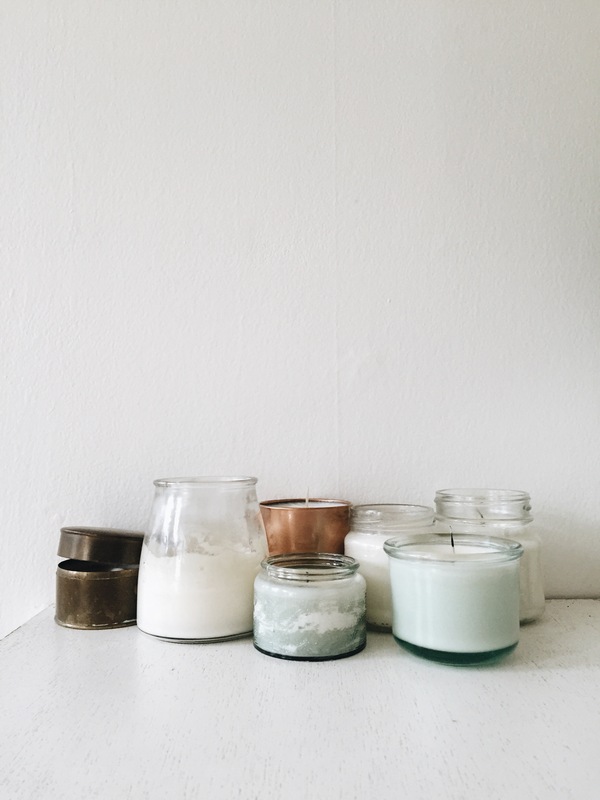 I keep old jars, thrift little metal tins, spray paint glass cups copper, and voila, a ridic ton of candles. I already have an entire post on how to make these, so I won’t bore you again. You’re like, ohgawdthankyou. And that’s it! We had a diffuser a long time ago, but I lost the adapter part and it’s been this whole thing like, “Where’s the adapter? Who has the adapter?” It’s become such a ridiculous joke that my sister STILL calls and asks, “Have you found that adapter?” And then I punch the phone. But like, where does an adapter GO? That said, when the babies were tiny, we’d dab a dot of lavender in the corners of their crib to help with sleep. And lastly, I rub the teeeeeniest bit of patchouli on my wrists as a perfume. I know you’re probably not supposed to have it touch your skin, but I’m telling you guys, I’ve been doing this for years, and there’s nothing wrong with mewrongwithmewrongwithme. Okie doke, I’d absolutely loooove to know how you use oils! You know I’ll completely obsess over any tips or new ways to use them. Hook a hippie sister up. I'm so excited to try both of these! I love NOW oils too. Their lemon is so...lemony. I have a cabinet of different oils, but honestly, I mostly use them as room sprays. A bunch of drops into a spray bottle with water and give it a shake before spraying. Love using lavender that way. Thanks for sharing! I love this post and the comments so far! I still just use my oils on my skin, in a diffuser (has worked wonders for my sleep!) and diluted in my tea and water. I need to graduate to room sprays for sure. My yoga mat cleaner is essential oils. It's lavender, eucalyptus, and tea tree oil. I need rosemary oil and mint so I can make your room spray. I imagine it smells like heaven. I have never used essential oils. I am intrigued. Although if I do start using them, my husband will l label me an all out hippie! this post is really timely for me. 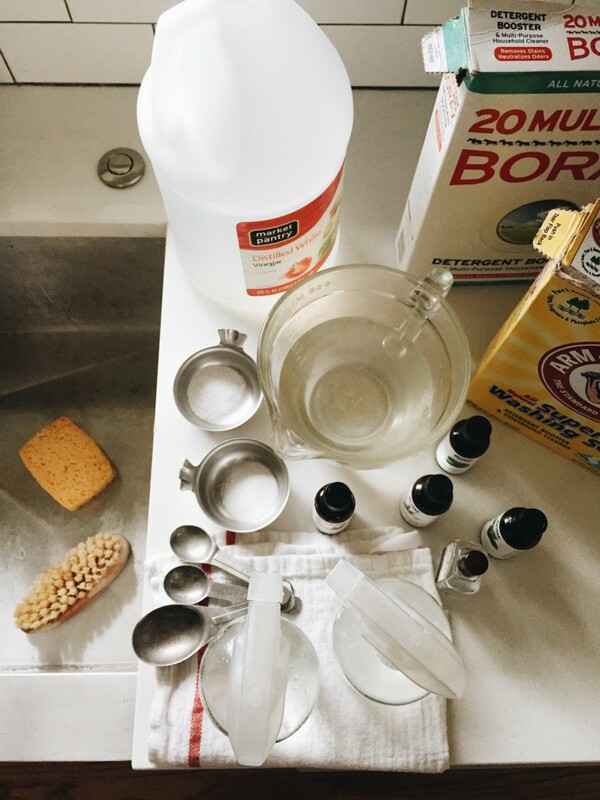 last night i made homemade body wash, lotion, and facial toner! i'm trying the whole oil cleansing thing - so far, i haven't grown any new face parts or melted. i say that's success. my next foray into hippie-dom will be cleaning products. i'm excited to mess around with scents for room spray! How do you make the face toner? I'm so intrigued! Does it work well? I love tea tree too. Thanks for the tips. I shared this article on my site. Love Young Living!!! I personally use them and distribute :) I actually make my own a lot of things haha I've gone hippie enough to make my own deodorant too! Oh awesome! I've been asked to distribute, but I have nooooooo extra time. Imagine that. Maybe one day! Love this ! My tip for oil based room spray in the loo............my better half but lesser brain (sorry, hon) was spraying the room spray towards my linen shower curtain and getting little spots on it so I came up with a plan. I asked him very politely, with a slight smile and my head tilted just so, if he could spray IN THE WASTEBASKET. There's tissues, empty TP rolls, etc in there usually so they hold the fragrance nicely but nothing oily is on fabrics or towels! Oh happy day. I'm a believer too! I diffuse either Thieves or YL Purification in my room and my daughters room EVERY NIGHT. I also put YL peace & calming on my feet at night and lavender on my sheets and it's like a friggin sleeping pill! I also drink lemon oil in hot water. And, i bring the lavender with me when I travel so I can get to sleep in a strange room. Oh! And- DIY deodorant: coconut oil + lemon oil! Ooh! And I use lavender + tea tree + coconut for diaper rash! OOOH! Also... Just kidding. I'm glad you are an oil believer, too!! Love these tips! Do you by chance have a recipe for a makeup brush cleaner? I don't have one, but I'm ALL ears for anyone who does! I just use gentle baby shampoo on my makeup brushes! Works great. Put some water & shampoo in my palm and swirl the brushes till the bubbles are clear. Then rinse well & air dry! Love this! 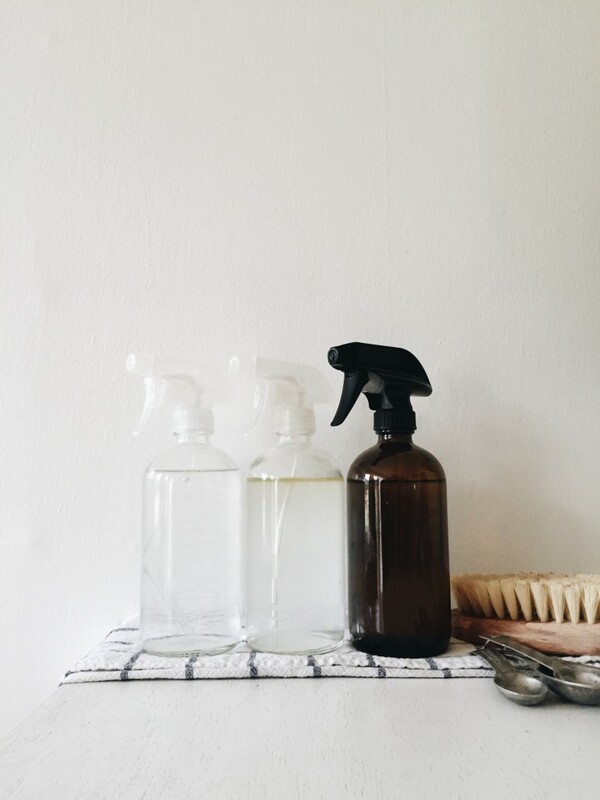 My go-to all purpose cleaner is 50/50 water + white vinegar with a lot of peppermint oil drops. I use it on glass, counters, bathroom, etc. I also make a paste with baking soda and castile soap (maybe 1 other thing..can't remember) that is great for grout/sink scrubbing! Your spray bottles are awesome. I have had a hard time finding them and never even thought to look on amazon!!! DUH. The spray bottles can be found at Wholefoods grocery stores in a number of different sizes if you have a store local to you...but if not you can order online through them as well. Thanks for this post, can't wait to try these recipes! I use tea tree oil for everything! When I'm breaking out I put a drop in my night face cream and rub it all over (it tingles a bit). For my daughter I rub roman chamomile + lavender + coconut oil on the bottoms of her feet! For smelly dog messes & stanky carpets I mix baking soda with tea tree oil, sprinkle it on, let it sit for 15 min and then vacuum it all up! Wow great tips from everyone! Be super careful about lavender oil around little boys as it is an endocrine blocker and mimics estrogen. We use oils for everything; cleaning, in homemade deodorant, diffusing (I just put a drop on a lightbulb, and even the LED bulbs heat up enough to "diffuse"), and I put a combo of eucalyptus and rosemary in a cool mist humidifier when we're sick. I also love essential oils. It is so crazy that it is now kind of a fad! I have a great book called The Naturally Clean Home! You would love it! Lots of good recipes. For cleaning the toilet, I add a slosh of vinegar and a few drops of tea tree oil. Freshy fresh! Also, I make a wood cleaner with murphy's oil soap, cedar oil, orange oil, and water. Lovely!! Mmm your room spray combo sounds like it smells amazing. Thanks for the recipes! My mother SWEARS by gargling with warm water with a few drops of tea tree oil whenever she feels the inkling of a sore throat. Didn't realize there was possible issue putting oils directly on your skin (probably due to my mom insisting I use a rinse of it in my throat, ha...), I put lavender on my wrists and maybe a little dab on my chest or forehead for some seeerious sleep assistance. 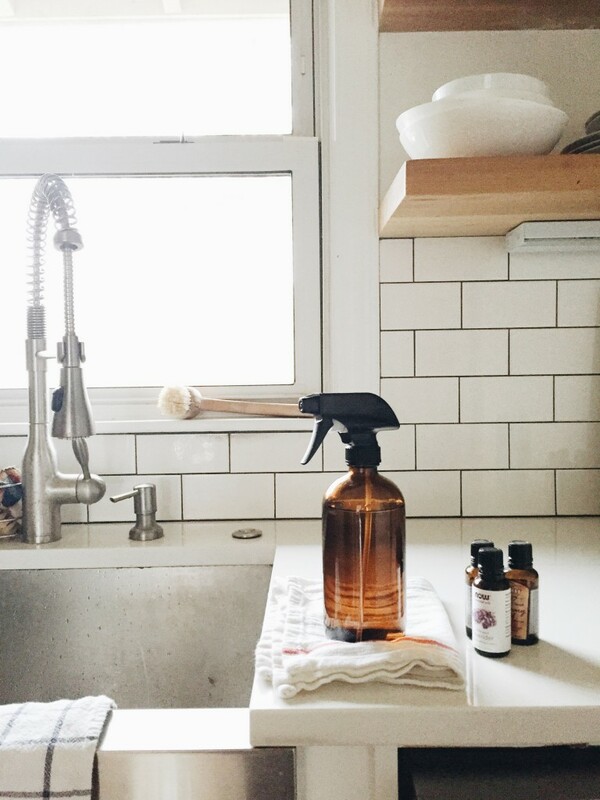 Love these recipes for spray cleaners!!! I already create essential oil room spray...have you ever checked out the Thieves oil - I've gotten mine from a friend who sells Young Living, but I think it's available elsewhere. I LOVE the scent...and yes, I do dab it on my wrists too from time to time :) I really wish I could find a DIY liquid dish soap recipe, so if you ever come across one, please share!!! Thanks! This is a great dish soap recipe! Liquid castile soap 10 drops lavender 8 drops rosemary 4 drops eucalyptus Fill a clean 22oz bottle with castile soap (dilute if needed) and add the oils. Just shake before each use! like tracy, im the same way. seeing essential oil craze im very interested in learning more..and thanks for sharing this. 2 cups hot water 10 drops thyme essential oil 1/4 cup washing soda This is the herbal disinfectant that i'm using. It's much child safe and smells much better than commercial ones. The gods of DIY have given your blessing amazing work! Thanks for the cleaning receipts. I don't use chemical cleaners anymore. Recently I got very disappointed with the results I got after cleaning with them, plus the smell is too strong for me. I have been wanting the Domino book forever! I always put it on my wish lists and Christmas lists. I’m just going to break down and buy it myself! haha I agree, giving a good gift isn’t too difficult when you know the person and their taste. I’m a big fan of wish lists, that way the recipient is still surprised, but guaranteed to love their present. I demand Christmas lists from my family and friends every year for this sole purpose. Borax is toxic, why would you suggest to use it for a natural air freshener? The gods of DIY and great dish soap recipe keep it given your blessing amazing work!